Maori were the original architects of the great Kiwi OE. That fact is easily forgotten in traditional narratives of early New Zealand history that emphasise European travel and discovery. But in the few decades before 1840 hundreds and perhaps even thousands of Maori had travelled outside Aotearoa — many to Sydney and elsewhere in Australia and others even further afield. England remained the ultimate travel destination for many Maori. The story of Hongi Hika’s famous 1820 encounter with King George IV is widely known. But how many people know the tale of how one chief from the Wellington region went to remarkable lengths to make the same journey? 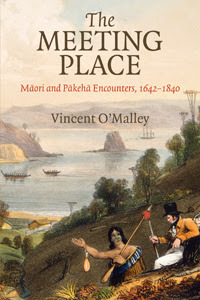 This is the story of Te Pehi Kupe and his amazing travels, as told in my recent book, The Meeting Place: Maori and Pakeha Encounters, 1642–1840. It must have been one of those rare Wellington days. In February 1824 the trading vessel Urania found itself becalmed as it attempted to make its passage through Cook Strait. Three large waka, together carrying about 80 people, soon appeared in the distance. Captain Richard Reynolds, alarmed at this development and uncertain as to the intentions of the approaching craft, ordered his crew to prepare for a violent confrontation. But as the largest of the canoes came closer, ‘one of the natives in it stood up, and by signs and a few words of broken English intimated his desire to be taken on board’. Reynolds refused permission, but the man in question, Te Pehi Kupe, a young Ngati Toa rangatira, was able to jump on board, employing signs to express his desire for muskets. His request rejected, Te Pehi spoke a few words of English, indicating his wish to go to Europe and see King George. Reynolds ordered his men to throw the chief overboard but Te Pehi, seeing what was intended, planted himself on the deck, seizing two ringbolts with a hold so tight that it was found impossible to loosen his grip. An attempt to land the chief the next day nearly ended in disaster for the Urania and so Reynolds reluctantly resolved to sail for his original destination of Lima with his unwanted guest on board. Reynolds and Te Pehi soon forged a close friendship, the captain and the rangatira living and dining together on shore during their stays at Lima and elsewhere in South America. Those bonds were strengthened even further when Te Pehi saved Reynolds’ life at Montevideo, the captain having fallen overboard. When the Urania reached Liverpool in February 1825, Reynolds took the chief into his home, despite being out of work, nursing Te Pehi through the seemingly inevitable illnesses which struck early Maori visitors to England and refusing offers to have his tattooed friend exhibited for money. The captain, who spoke a little Maori, was also required to act as interpreter on a number of occasions, since Te Pehi’s English never progressed much beyond that previously displayed in the Cook Strait. Te Pehi’s doctor also befriended him, organising a number of excursions throughout Britain once the rangatira had recovered from measles. Everything relating to agriculture and smithwork was of particular interest to the chief, who also took an instant liking to the bow and arrow. The first sight of a horse astonished him, and it was not long before he was being thrown off one in his efforts to learn to ride. A military review involving a regiment of dragoons also appealed greatly to his tastes. Te Pehi visited factories, museums and other sites in Liverpool, Birmingham, Gloucester and London during his several months in England. Said to be ‘conscious of the propriety of conforming himself to the customs of the country in which he was’, Te Pehi ‘was constantly on the watch to observe the behaviour of those around him’, picking up the finer points of English dining etiquette after some initial errors. But the chief was also at pains to ensure that at least some of his own customs were communicated to those English he encountered. 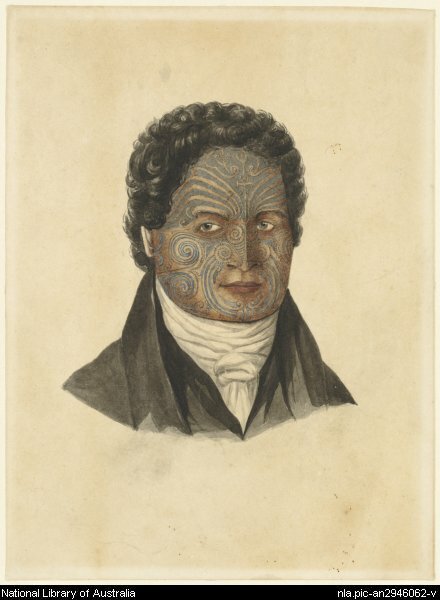 He took the greatest interest in a sketch of his face, emphasising the importance of his moko being accurately represented and explaining that the lines were not mere works of art or decoration but the Maori equivalent to an Englishman’s signature. 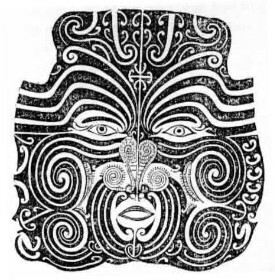 To reinforce the point, he prepared his own detailed sketch of his facial moko from memory. Although for most of his time in England Te Pehi was perfectly happy to shake hands with those he met, he insisted upon exchanging hongi with his closest companions when taking a final leave of them. Yet it is clear that there remained ample grounds for moments of cultural confusion. And just as with earlier Maori visitors to England, Te Pehi was himself an object of considerable curiosity wherever he went. According to one account, whenever he rode out with his European friends, immense crowds of spectators mobbed Te Pehi, much to his satisfaction. One day, a girl selling oranges held up her basket to invite him to purchase some. Under the impression that she was offering the whole to him as a present, Te Pehi forthwith began to gather all the fruits into his carriage. Finding it impossible to explain the matter, Te Pehi’s companion secretly paid for the oranges, Te Pehi later telling Reynolds how extremely kind the people had been in making him presents. The giving of gifts and generous hospitality towards important visitors were so ingrained in Maori culture that it seems Te Pehi was incapable of viewing these initial encounters in any other way. In this respect his experiences seem similar to those of the northern sojourners who had preceded Te Pehi. For all of these early travellers, British society was viewed through uniquely Maori cultural filters. Europeans who confidently predicted that Maori exposure to a ‘superior’ civilisation would work wonders on the visitors were constantly disappointed. Te Pehi, like Hongi, was soon back fighting his tribal enemies — ironically employing muskets gained during his time overseas, and dying in battle just a few years later. Yet his experiences in England may have helped persuade Ngati Toa and other Cook Strait iwi to encourage trade and commerce in their region. 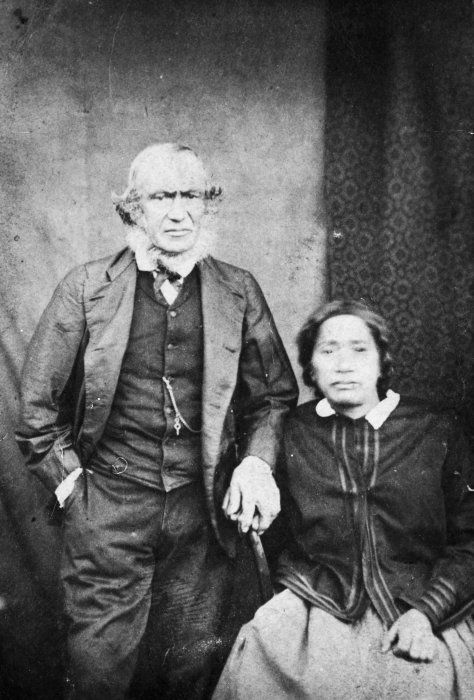 In this way, Kupe’s voyage prepared the path for the distinctive mixed families like the Loves, the Thoms and the Heberleys of the Wellington region. In 1840 the Ngati Ruapani people lay claim to an area of more than 250,000 acres around the shores of Lake Waikaremoana (much of it subject to overlapping or contested claims from other hapu and iwi). Today, with the exception of a few tiny reserves, they are a landless people. The process by which Ruapani lands were wrested from their ownership and control was a long and at times complex one. Yet one key theme dominates the history of land alienation in the region: the Crown’s acquisition of almost the entire land base of Waikaremoana Maori was achieved only through compulsion or coercion. Ngati Ruapani never willingly parted with any of their lands. Ownership of the lakebed of Waikaremoana itself was also bitterly contested between Maori and the Crown. Although the Crown lost that battle, it effectively won the war by ignoring Maori ownership of the lakebed for half a century, and then imposing a settlement that gave it perpetual access to the lake. But the battle for control of Lake Waikaremoana was merely one instalment in a much longer saga of conflict with the Crown in the region. In the 1860s Ngati Ruapani found themselves caught up in the maelstrom of the New Zealand Wars. When government troops invaded the Waikato in 1863, some Urewera Maori saw this as a direct threat to their own way of life and rushed to the aid of their beleaguered Tainui kin. Two years later Waikaremoana Maori were attacked by government forces in punishment for adopting the allegedly ‘fanatical’ new Pai Marire faith. Several so-called ‘Hauhau’ prisoners were subsequently executed by government-allied troops from other tribes. Worse was to follow in the late 1860s, when Waikaremoana Maori provided shelter to the prophet and commander Te Kooti. Crown forces engaged in a systematic scorched earth policy around the shores of Lake Waikaremoana, torching all homes and cultivations in the area. Hundreds of Maori throughout the Urewera district were said to have died of starvation as a result. Hungry and homeless, the remainder had put down their arms by the early 1870s, encouraged (as Judith Binney has shown) by promises that the Crown would allow them to continue to control their own lands and other affairs, through institutions of their own choosing. Despite such promises, 172,000 acres of Ruapani land on the southern shores of Waikaremoana was in 1875 awarded to ‘loyalists’ from the lower Wairoa district, in accordance with earlier agreements of 1867 and 1872. The decision of the ‘rebel’ Ruapani and Tuhoe tribes to withdraw their claims to this land, leaving the way clear for the ‘loyalists’ to promptly sell the land to the Crown, followed receipt of a telegram from the Native Minister warning that the Native Land Court’s jurisdiction was under the East Coast Act of 1868, by which any interests they were found to have to these lands would immediately be confiscated in punishment for their ‘rebellion’. Critics of this government tactic called it ‘begging with a bludgeon’. Notwithstanding the brutal and devastating years of warfare and land confiscation that had been visited upon them, Ngati Ruapani persisted with their opposition to land alienation and their determination to control their own affairs. Yet the unwelcome and costly Native Land Court was now a fact of life on the fringes of their remaining territory, and from the 1880s onwards Ngati Ruapani were forced to participate in hearings concerning their Waipaoa lands or once again lose all. 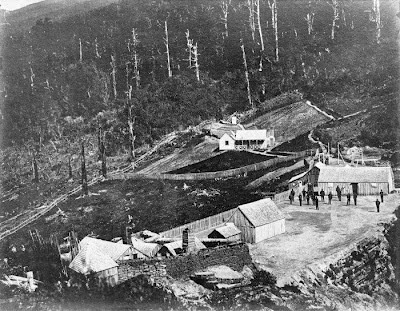 Like many iwi, they found the court’s ordinary operations to be as unpleasant as any under confiscatory legislation and by the early twentieth century their interests in Waipaoa had been extinguished — taken to pay huge survey costs or purchased by Crown officials taking full advantage of the poverty to which many Waikaremoana Maori had now been reduced. Just one major land block now remained in Ngati Ruapani ownership. The Waikaremoana block, bordering the northern shores of the lake and containing nearly 75,000 acres was, like other lands in the district, the subject of special legislation passed under agreement with the Crown. The Urewera District Native Reserve Act 1896 had promised Urewera Maori continuing tribal control and ownership of their remaining lands. From 1900 onwards, however, a series of legislative enactments weakened the provisions of the legislation to the point that by 1916 the Crown could embark on a policy of full-scale acquisition of individual interests from as many Maori as could be persuaded to sell. And with poverty now rife in the region, and tribal leadership deliberately marginalised and undermined, this was not hard to do. Despite their desperate plight, Ngati Ruapani had held out against any alienation of their remaining tribal patrimony. 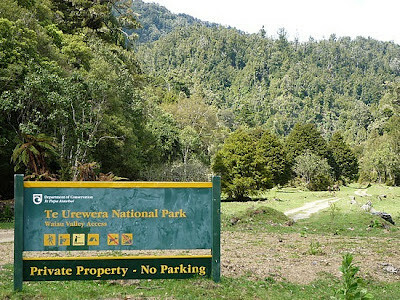 Even so, with the lake’s potential to generate hydro-electric power now recognised, the Crown was determined to acquire the Waikaremoana block. After seriously considering compulsory acquisition under scenery preservation legislation, it eventually agreed with a Tuhoe proposal to include the block in the newly-established Urewera consolidation scheme. Faced once again with the compulsory acquisition of their last remaining land, Ngati Ruapani sought to retain a modest 3200 acres in reserves around the lake. In the event, in 1923 they were forced to accept a mere 600 acres and a small payment by way of debentures for their last substantial landholding. 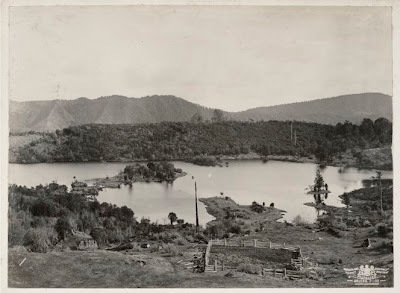 In 1921 Apirana Ngata had informed the government that Ngati Ruapani’s ‘chief need’ was for farmable land to the south of the lake, close to their Kuha and Waimako settlements. Yet Crown indifference to their plight meant no such land was reserved to them, hindering Ngati Ruapani’s ability to generate any farming income. When depression struck in the early 1930s, it struck an already impoverished and landless people harder than most. And incredibly their plight was made even worse by the refusal of the Native Trust Office to pay them money owing on the debentures used in payment for Waikaremoana — and by the unilateral decision of two Cabinet ministers to reinvest this capital sum on maturity. Various deductions made in the amount payable — all in breach of the original agreement — and the regular harassment of Ngati Ruapani for petty sums owing on bills for electricity generated from their own lake — bills they could not afford to pay until they received the money owed them by the Crown — hardly helped matters either. In 1935 Judge Harold Carr of the Native Land Court, a former consolidation commissioner for the Urewera district, wrote that Ngati Ruapani were in ‘distressingly poor circumstances’. 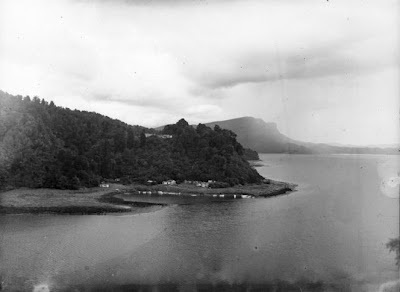 In some cases they had attempted to lease out their few remaining reserves around the lake, in defiance of Crown restrictions against all but the government acquiring rights to these, and Carr wrote in defence of the tribe that ‘persons not concerned or not conversant’ with the history of how the Ngati Ruapani people had lost their lands should not be harassing them ‘in the ownership of their birth-right’. Yet despite similar pleas from Ngati Ruapani themselves, the few remaining reserves dotted around the lake were loaded with so many restrictions on their use that they were all but a liability from an economic perspective. The owners might be charged rates, but could not build on their reserves — and could not even hunt on their own lands without winning a special license to do so by means of a ballot. And for more than twenty years the Government unsuccessfully badgered Ruapani into selling their last remaining reserves at the lake. Sympathetic and often shocking reports from Crown officials in the field met with terse responses from head office in Wellington. Even while Ngati Ruapani’s plight continued to remain desperate they found themselves engaged in a mammoth legal battle with the forces of the Crown over the ownership of their one remaining asset, Lake Waikaremoana itself. In 1918 the Native Land Court had awarded the title of the lake bed to Maori, at a hearing which the Crown failed to even attend. The Crown nevertheless rejected the court’s judgment, arguing against overwhelming evidence to the contrary that the lake belonged to the Crown. After a staggering twenty-six year delay, the Crown’s appeal was finally heard and dismissed in 1944, with further inter-tribal appeals eventually settled in 1947. In the meanwhile, though, ignoring Maori ownership of the lakebed, the Crown had proceeded to build a hydro-dam at Waikaremoana (drastically reducing water levels and depleting fish stock in the lake), as well as exercising numerous other rights of ownership. And with unbounded arrogance, the Crown continued to contemplate squashing the court order by legislative fiat. Finally, in 1954, the Crown reluctantly acknowledged Maori ownership of the lakebed. Yet against an overwhelming Maori desire to merely lease this to the Crown (whose illegal occupation of the lakebed was now a fait accompli), the government persisted with a lengthy campaign to persuade the owners to sell. This pressure was only halted in 1971, when the Crown secured a fifty-year lease of the lakebed (with a perpetual right of renewal) at 5.5% of the valuation. From the Ngati Ruapani perspective this agreement was seriously flawed. No compensation was payable for the considerable hydro-electric revenue the Crown generated from the lake, and the deal was backdated to 1967, when there were very strong claims for it to be backdated to 1918 or even earlier. Effectively, the Crown had trespassed on the lake for fifty years and got away with it more or less scot-free. Moreover, the Lake Waikaremoana Act 1971 also transferred legal title over the lakebed to two Maori trust boards whose mandate to represent the people of Ngati Ruapani has been much disputed. The establishment of a national park in the area in the 1950s may have been a boon for visiting trampers and hunters. But for tangata whenua the presence in their midst of the Urewera National Park has often been difficult to reconcile with their own traditional uses of the land and its resources. Sadly, continuing desecration of wahi tapu located in the park only adds to the tribe’s anguish. Yet despite the unremittingly bleak and unfortunate nature of Ngati Ruapani’s contacts with the Crown since 1840, there is a positive note to this story. Of more recent times a number of younger Ngati Ruapani tribespeople have returned to the lake to discover their rich tribal ancestry, a movement which will be stymied only by the tribe’s continuing state of near landlessness. The settlement of their historical claims (and with it perhaps an opportunity to revisit the unjust perpetual Crown lease of their lakebed) can not come soon enough for the tangata whenua of Waikaremoana. It’s been said that history is just another excuse for us to feel superior to our ancestors. We are so much smarter, more sensitive and certain of our place in the world than they ever were. Or at least we like to think so. But what if we could learn from those who went before us? That would be consistent with the old Maori saying about the past always being before us. From this perspective, history is less a linear story of boundless progress, than a more circular tale in which we sense we have somehow been here before. New Zealand, here in the early years of the 21st century, stands on the threshold of a world it last inhabited nearly two centuries ago. That might seem a surprising claim, given that we associate the early 1800s with conflict and chaos. And it is true that pre-Treaty Aotearoa could be a dangerous and volatile place. But what I argue in The Meeting Place: Maori and Pakeha Encounters, 1642-1840, is that what mostly bound Maori and Pakeha in those raw-boned decades was mutual self-interest. The ‘middle ground’ world that flourished before 1840 was built on interdependence and shared self-interest. Those factors allowed Maori and Pakeha to remain comfortable in their own cultures, while finding fresh ways of dealing with each other in the spaces in between. Which brings us to 2012. The remarkable Maori demographic recovery from near extinction in the early 20th century through to a booming population today, along with the resurgent Maori economy, point to the potential for a new middle ground to emerge. Hapu and iwi, newly recapitalised through the Treaty settlements process, are again becoming major players in our economy. New forms of accommodation may emerge out of mutual self-interest because Maori and Pakeha again find things of value in each other that cannot be obtained by other means. Finding the middle ground is of course as challenging today as it was two centuries ago. As the first Europeans began to take up residence in New Zealand in the early 1800s, they were forced to find ways of living with and alongside their far more numerous Maori neighbours. For larger-than-life figures like Jacky Marmon, Barnet Burns and John Rutherford the solution was to adopt the lifestyles of Pakeha-Maori. Marmon, for example, engaged in tribal warfare alongside his host tribe and was believed to have also indulged in the cannibal feasts that often accompanied victory on the battlefield. 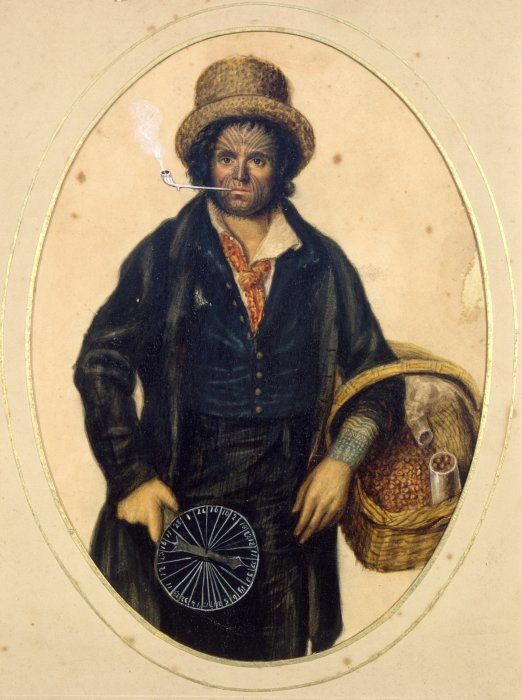 These men were a motley group of desperate characters — often consisting of escaped convicts from the penal colonies of New South Wales and Van Diemen’s Land or sailors who had jumped ship at the Bay of Islands. Charles Darwin called them the ‘very refuse’ of British society after his 1835 visit to New Zealand. Yet these mostly illiterate and uncouth men (many of them Irish Catholics, a further mark against them in the minds of the so-called respectable classes) were drawn to the Maori world and learnt to abide by its rules since they knew there would be consequences if they failed to do so. 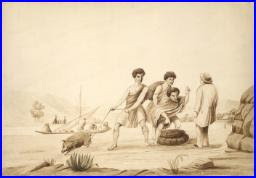 For the missionaries who took up residence in the north of New Zealand after 1814, or others such as visiting sealers and whalers, absorption into the tribe was not an option. Once Maori gained access to muskets, they were in a position to impose their will on the few hundred Europeans resident in New Zealand. But to do so risked driving these people away, and so ending the steady access to iron, muskets, axes, hoes, blankets and pipes that Maori had come increasingly to depend upon. Because Maori and Pakeha had a mutual need for one another, new rules and new forms of engagement that drew upon both cultures and societies but belonged wholly to neither began to emerge. Even before embracing Christianity themselves, many Maori communities were careful to observe the Sabbath — ‘the white man’s tapu day’, as they called it — because in their conception failure to respect any tapu carried serious consequences. Maori also learned to shake hands with the newcomers, while transferring across to the gesture the meanings of their own hongi. Missionaries complained that early Maori handshakes went on forever, the longer this took the more it was said to reflect the depth of feeling that went into it. Both parties learnt to trade with one another but not always in ways that either group would have previously understood. For Maori outright haggling over the terms of trade was a definite no-no before 1769. Meanwhile Europeans were unaccustomed to the notion that they should purchase everything a chief offered them, whether they wanted it or not, simply as a token of friendship and reciprocity. The key to this uniquely hybrid world was that both Maori and Pakeha had things which the other party wanted but could not gain by force. But all that began to change after 1840, as large numbers of Europeans unfamiliar with the old rules of pre-Treaty Aotearoa began to vastly outnumber Maori. The kind of rough and ready balance of power that had sustained the old order increasingly no longer applied, even if the incoming migrants remained dependent on Maori labour to feed them, and build their houses and roads, for much of the period to about 1860. After that date, Maori who had invested great hopes in a future society built upon mutual accommodation and new ways of interacting that drew upon both cultures found themselves expected to straddle the two cultures on their own, at least until the tide began to turn ever so slightly from the 1970s onwards. Today hapu and iwi are assuming major roles in the New Zealand economy. Maori and Pakeha are recovering and rediscovering things of value in each other that cannot be obtained by other means. In this way, the past may be truly ahead of us.